For me, the best swims are when I go on a journey and find hidden places that only an aquatic adventurer can get to. 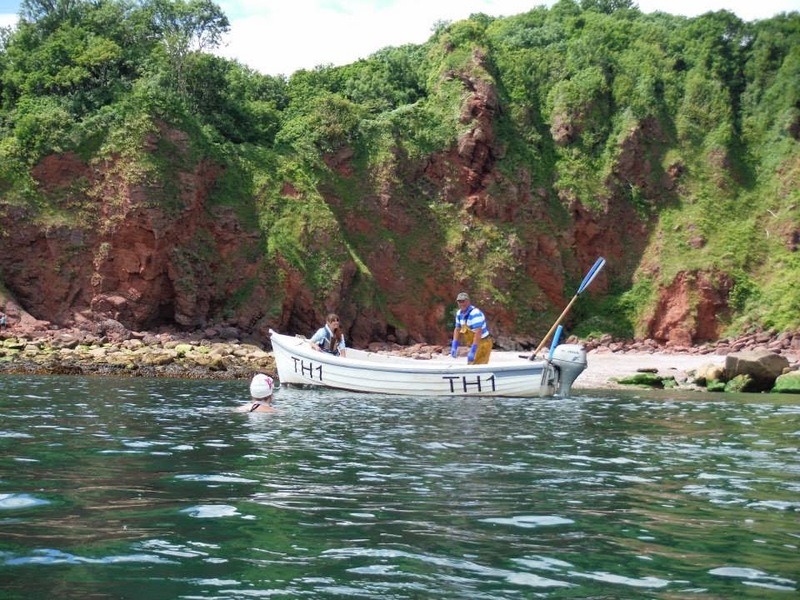 At Watcombe today we did just that - in petrol-blue seas, alongside terracotta cliffs and into starfish-studded caves and gullies. It was low water on a big spring tide, and as we arrived at the cove we could see out to a beautifully flat sea; Mike in the cafe told us they'd seen dolphins swimming past the day before. We swam out, over a luxuriant kelp forest, and northwards along the coast where we passed White Beach and a fisherman checking his pots. On we went, and into a cave where we found an edible crab sheltering in a perfect crab-sized niche. The dark slit of a swim-through in the rocks ahead beckoned....in we swam, where we found the most amazing array of starfish. There were hundreds of them, in all shapes and sizes, all over the rock faces. We carried on to Bell Rock and through the 'eye of the needle', gazing up at the high water mark metres above us, the kelp swinging over our heads. Back at the beach, we feasted on Mike's beautifully thin French fries with mugs of tea, while a friendly chap regaled us with his fishing stories, including an amazing one about how, when casting off the rocks for mullet, a dolphin swam past, and rolled on its side where its suckling baby was visible. When we arrived at Anstey's Cove it was picture perfect. Emerald sea like a pond. Sun sizzling on the horizon. The mysterious stone pinnacle - aka the Witch's Hat - beckoning us. 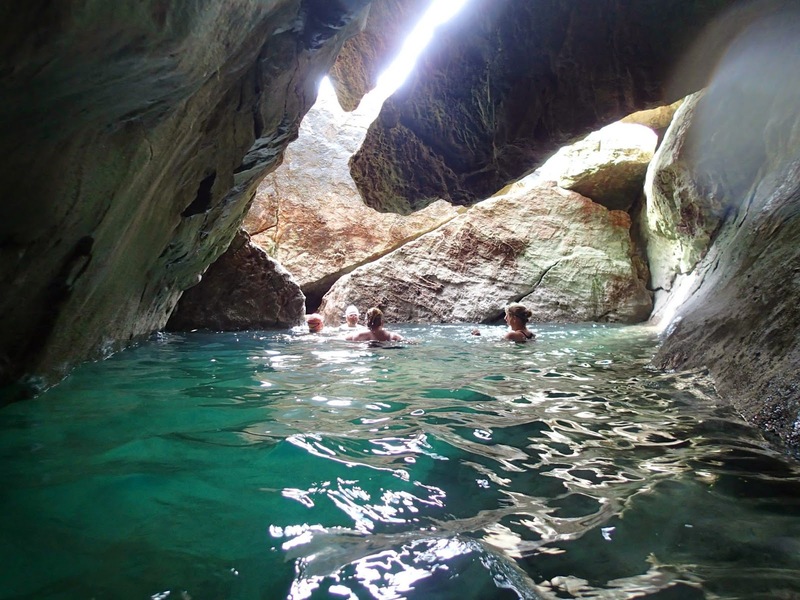 We swam across the bay, chatting, and enjoying the warmth of the water, towards the secret entrance to the hidden cave. Last time we tried to get in, there was too much of a swell, but today the sea was calm. 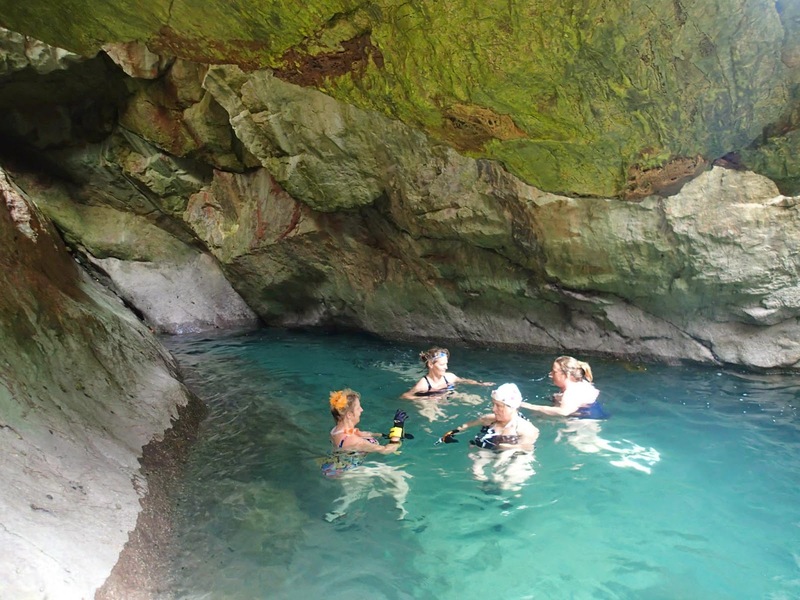 As we swam into the gulley towards the cave the colour of the water intensified. We climbed through the gap, and there was the secret pool, with its skylight above. We floated, our voices echoing, and then dived down to look at the pebbles below. Thanks to Richard Lowerson for the pictures. And you can see a video below.